Artificial Intelligence (AI) in Education Market size was estimated to be over USD 400 million in 2017 and is anticipated to grow at a CAGR of more than 45% over the forecast timespan. AI in education market is propelled by the integration of the advanced technologies and intelligent algorithms into the e-learning platforms. The influx of innovative learning models and technologies, such as educational software, machine learning, and Artificial Intelligence (AI), has changed the role of educators, creating a shift in the teaching methods and transforming the classroom. Over the past five years, the technology has gained a significant level of sophistication due to the rise of AI and advancements in machine learning algorithms. AI technology has become an important tool for developing a user-friendly decision-support system and is widely being used in the areas of language translation, information retrieval, and knowledge acquisition applications. The adoption of cloud services among the education institutes also drives the artificial intelligence in education market. The cloud computing technology is increasingly being used by educators, faculties, facilitators, and students of schools and higher education institutes to improve the productivity and the overall learning experience. The increased usage of cloud services reduces the cost of ownership for educational institutes, which enables them to invest in the maintenance and support of infrastructural developments required to provide high-quality education. Cloud computing allows the schools and universities to upgrade their prevailing infrastructure with the advanced technologies without any substantial increase in their capital costs. The learner model held over 60% share in the AI in Education market in 2017. The learner model essentially represents the knowledge of learners such as the students’ emotional state, previous failures, achievements, and their engagement capabilities in learning. It represents the interactions that happen between the learner and the computer, which are then utilized by the domain and pedagogy models to determine the success of the learner. 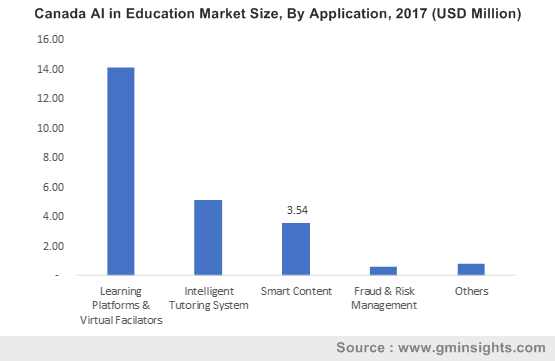 The adoption of the adaptive learning technology by the market players to develop student-centric learning platforms is the primary factor supporting the artificial intelligence in education market growth. The technology is being used by the market players for designing the digital content and modifying the content as per the students’ requirement. Furthermore, the capabilities of the adaptive learning technology are also being integrated into the learning platforms to assist students in the learning process and track their progress. The on-premise deployment model accounts for more than 80% artificial intelligence in education market share in the revenue in 2017. The deployment provides robust functionality and superior data security. However, high capital requirement and the need to reduce the operating costs among the organizations are the major factors that impact the demand for the on-premise system. Cloud deployment is estimated to grow significantly during the forecast period at a CAGR of over 50%. The popularity of the outcome-based lease model is propelling the demand for the cloud-based systems. Furthermore, other benefits offered by this deployment model, such as no capital expenditure, flexibility, and scalability, are also estimated to augment the demand for the product. NLP is leading the technology landscape with approximately 65% share in the artificial intelligence AI in education market. The education sector is adopting the NLP capabilities for bringing the improvement in curriculum and the assessment process. The integration of NLP technology in educational institutes not only assists in developing an effective digital content but also helps in improving the academic performance. Moreover, NLP also assists in the process of e-learning and content development via web-based information. Machine learning also held over 20% of the artificial intelligence in education market share in the revenue in 2017. The technology offers a customizable learning experience, student path prediction, and suggested learning path, identifying the weaknesses and analyzing the areas that require improvement. Furthermore, the technology also assists in developing an unbiased grading system and feedback mechanism for both students and teachers. The learning platform and virtual facilitators application market is estimated to have over 55% share in the revenue in 2017. The adoption of the e-learning platforms and the integration of the advanced technologies, such as augmented reality and virtual reality in the education sector, are the primary factors driving the artificial intelligence in education market growth. Furthermore, educational institutions are using simulations, games, and the AI technology to encourage students to enhance their learning experience as well as gain and improve knowledge. The growing trend that is gaining traction is virtual tutors and virtual classrooms. The demand is driven by the improvements in the bandwidth and collaboration technologies that enable the virtual model to turn into a practical solution for learning efficiently and cost-effectively. Education institutes are collaborating with the EdTech companies to provide graduate and undergraduate programs based on virtual platforms. They are developing open online course platforms that offer free education to the global audience. The higher education sector accounts for more than 50% share in the AI in education market. The higher education institutes are shifting to AI to assist them with course recommendations, administrative assistance, and career path options for students. The other benefits offered to the students include personalized learning and the provision of smart classrooms, delivering quality education. The rising demand for a specialized workforce to deploy AI across various educational institutes and industries has led to an improvement in the quality of education offered to students resulting in the overall development. As a result, various private and public colleges and universities are adopting advanced educational services, accelerating the growth of the artificial intelligence in education market. North America is leading the artificial intelligence in education market with over 60% share in the global market. The growth of the market is attributed to the early adoption of technology in the education sector and highly developed education infrastructure. The high venture capital investment in the AI technology and EdTech space fosters the market growth. Whereas, the European market is anticipated to grow at a CAGR of over 45% with during the forecast timeline. The growth of the market is credited to the increasing digitalization initiatives and growing investments in AI. 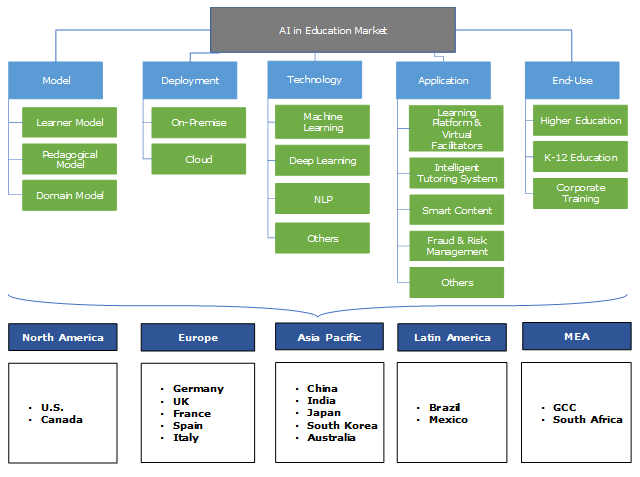 The presence of the major market players, such as Google, IBM, Microsoft, AWS, Pearson, blackboard, supports the AI in education market growth. The players are collaborating with the educational institutes to deliver learning platforms and provide digital content to the students. For instance, in May 2018, the Colorado State University (CSU) partnered with Cognii, a chief provider of AI-based educational technologies to offer AI-based online education. The AI in education market is highly competitive due to the presence of multinational companies and start-ups. The multinational companies, such as Google, Microsoft, AWS, IBM, and Nuance Communication, dominate the market. However, some regional players such as Cognii, Sofia Labs, PLEIQ, Knewton, Luilishuo, and Brainly also contribute significantly to the market. The multinational companies are leveraging their global presence and strong financial and human resources to cater to the growing demand for AI-based solutions. The major artificial intelligence in education market players are adopting the merger & acquisition activities to gain the market share and acquire technical expertise and patents. Whereas, the regional players are adopting product innovations and development strategies to gain a competitive edge and increase the customer base. They are also collaborating with the education institutes to provide e-learning and digital courses to the students. The technological advancements taking place in the last decade have had a positive impact on the field of education. Modern online technologies and digital education have changed the way of learning and teaching. The current period of pervasive technology has a vast implication on education. Both private and public educational institutions approve that technological inventions will have a huge impact on the teaching environment over the coming 10 years by attracting students and corporate partners in organizations.